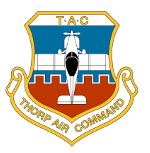 Thorp Air Command - T18.net • View forum - Interested in a Thorp? Delaware thorp n9MR on barnstormers. Anyone know the plane? New thorp owner, would like to learn more! A big shout out to Howard and Elaine Ginn.